PROS: The 3/4 size makes it easier for kids to hold and play. It has a low price point compared to similar quality guitars. CONS: Since this is a nylon string guitar you will need to spend some time letting the strings stretch before it stays in tune properly. SUMMARY: This instrument is a good value and will help your kids get interested in guitar. It is an excellent price, easy to play and has outstanding sound quality to it. 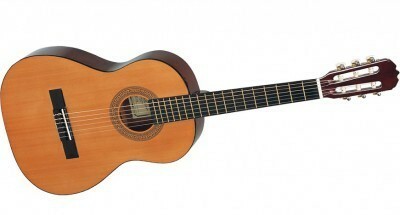 For the price, you will have a hard time finding a better 3/4 sized classical guitar that will work as well as a good starter guitar for kids. If you are looking for a decent beginner guitar for a child in the 8 to 11 age range who is starting to get interested in learning to play, this is a good nylon stringed instrument for under $100. The Hohner HC03 Student is a 3/4 sized guitar that is good for younger kids because it is smaller than a full-sized model, making it easier and more comfortable to play. This model has reasonably good sound quality for a guitar in this price range and stays in tune well for a beginner instrument. It is made by Hohner, who produce mostly lower end budget guitars. They tend to be better quality than you get with toy store brands for around the same price. If you are buying for a child who is taking lessons and your budget allows, I would probably go a little higher end than this model – something from Yamaha would probably be a better option. The Hohner HC03 has a scale length of 23.22″ and a nut width of 1.77″. It has a spruce top, and a nato back, sides and neck. The 18-fret fingerboard and bridge are made of hardwood. The HC03 is designed for players between ages 8 to 13, so it’s 3/4 size helps it to have great playability for kids. It has a nice fingerboard and bridge, that is very smooth and easy to play. For the price you would have a tough time finding an instrument that sounds as nice as the HC03, it produces a kind of a nice rich, deep sound. Since it is a 3/4 size, it the sound isn’t as full or loud as a full-sized, but for a children’s guitar, it is loud enough. It does need to be tuned a lot, but that isn’t necessarily a terrible thing for a beginner. The quality on the HC03 is surprisingly good quality; there are a few cosmetic imperfections but nothing much that affects the playability. Again for the price, this is quite a well-made instrument. Since this is a classical style with nylon strings, you need to remember that when you first get the guitar, you should let the strings stretch out a bit so that the strings can stay in tune better. Letting the nylon strings stretch and settle and then retune a few times in the first few days or so after purchase is standard on classical guitar. After about a week they should settle. Classical styles also tend not to have marking dots on the fretboard which might be an issue for some players; you can add fretboard marker or stickers if that is helpful for your child.